Hand-crafted in the U.S.A., each piece of furniture is designed and built by master craftsman Michael Hatzigeorgiou, who has been creating innovative quality furniture for the past thirty-eight years. Dining tables, coffee, and end tables are created using a variety of metal laminates, wood finishes, and natural bark papers to create a distinctly modern look. Unlike other contemporary furniture, Hatzi Designs provides furniture which is comfortable and functional. 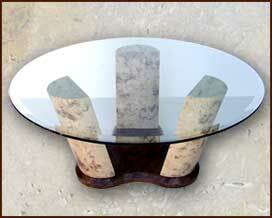 We have designed a unique collection of coffee tables which have the "Wow!" factor in any home. Sleek lines, original concepts and eye-popping finishes make these coffee tables a welcome addition in any home. With 40 years of experience, master craftsman, Mike Hatzigeorgiou skills extend well beyond contemporary design. Call us for that special item – we'll have a solution. 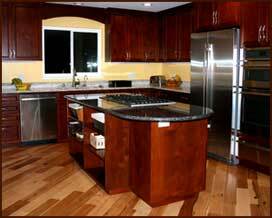 You'll be amazed how afordable something like our custom kitchen cabinets are! 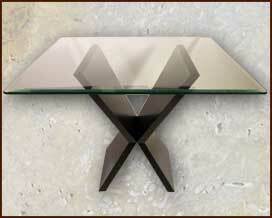 Just like the cofee tables our contemporary dining tables will enhance any home. Each item is handmade here in the U.S.A. to order and in many cases you can customize the size and finish to suite your home.